Listening to NPR while driving in my car is a joy. Almost every day I find out something new. Today while driving I listened to a program about Our Bodies OurSelves, and how it was saved through internet crowd funding. Robin Young, of “Here & Now,” spoke to the new executive director, Julie Childers, who went to college in Tulsa, Oklahoma. That made me laugh. The new ED of the “Our Bodies Ourselves” organization went to college in what is now a state worse than Kansas. Ugh! Oklahoma has not been very good to women’s issues. Maybe that is why she is working on this important book. 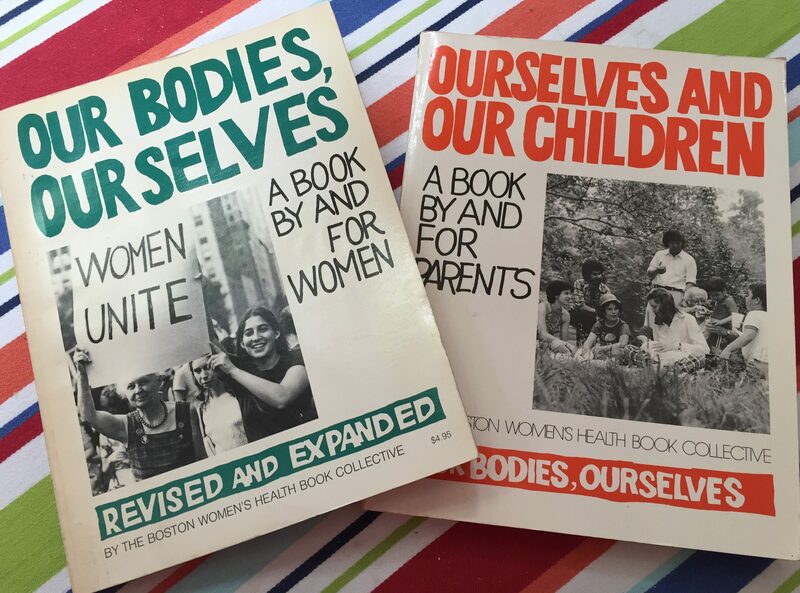 In any case, when I got home, I pulled out my 1976, second edition copy of Our Bodies, Ourselves and my 1978 first edition of Ourselves And Our Children. There was still a paper napkin marking a spot in the book that I obviously felt was important. I was 21, and a college junior when I purchased my copy. For those of you who might not know, before Our Bodies, Ourselves there was a dearth of information for women about their own health issues. The medical field seemed to be ruled by men, who did not really understand women’s health issues. I, personally, had horrible time during my menstrual cycles. And was told as a young girl that it just me. And I should get over it. To be honest, now I only go to women doctors for my major health needs. I grew up in a time when men really did not get it! It was Our Bodies, Ourselves that helped me. I know I am one of millions, who must thank the Boston Women’s Health Book Collective and their work to help women learn about their own bodies, their sexuality and their health care. Although I have not taken to the streets, I have been a strong supporter of women’s rights, and their reproductive rights, throughout my adult years. Our Bodies, Ourselves was my second awakening to women’s rights issues. My first occurred the day before my 18th birthday, when the “Roe Vs Wade” decision was announced. The young women today have lived their lives not knowing the battles of the 70s and early 80s. They do not have the workplace issues we faced. But most important, with the rise in so many more women doctors, they no longer face the condescending attitudes to our health care needs that we often faced. I thank Our Bodies, Ourselves for this awakening of women’s health needs and the evolution of medical care.